Veal Chops, marinated in a barbecue sauce and grilled, classic summer. 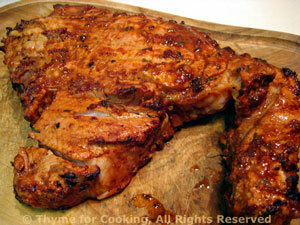 Veal tends to be a mild flavored meat that lend itself well to robust sauces and marinades. The chops can marinate anywhere from 1 - 6 hours so start the marinade whenever you have a spare 5 minutes. Mix all ingredients for marinade and pour over chops. Refrigerate for at least 1 and up to 6 hours. Remove chops from marinade and cook on barbecue grill for 4 - 6 minutes a side depending on thickness or until done to desired degree. Could also be sautéed or broiled for about same amount of time. Serve. Note: The nutrition info assumes that 50% of the marinade is eaten..